Richard Hall could be a trump card for Panthers. Team boss Carl Johnson has challenged Panthers to begin the process of salvaging their season by giving SGB Championship rivals Sheffield a taste of their own medicine tonight (Thursday). The city racers head to Owlerton Stadium (7.30pm) intent on claiming an immediate slice of revenge after slipping to a 48-45 home defeat at the hands of the Tigers last Sunday. It was a result which stopped a mini-Panthers revival its tracks and left them facing a monumental task to claw their way back into play-off contention. Johnson’s men find themselves a dozen points off the top four after competing a third of their league fixtures, but he is confident that position can change quickly. Panthers face three crucial outings in the space of four days with tonight’s trip north followed by home clashes against rock-bottom Berwick (tomorrow, 7.30pm) and title-chasing Glasgow (Sunday, 5pm) at the East of England Arena. “We have 10 points up for grabs in the next few days,” stated Johnson. “And we’ll be doing all we can to pick up as many of them as possible. “We know we’re not in an ideal position in the league table, but we all believe we are capable of reaching the play-offs. We have meetings in hand on all but one of the teams above us and we need to make the most of them. “The first target is to go to Sheffield and do what they did at our place last weekend. They have a lot of riders who like our track and were able to get a result here, but the boot is on the other foot tonight. “The pressure will be on them, but we’ve had success there in the past. It’s a track the vast majority of our guys like and in Richard Hall, who has spent a lot of his career at Sheffield, we could have a trump card at reserve. Panthers are at full-strength tonight and on Sunday, but they’re without number one Chris Harris for the clash against Berwick tomorrow. He is riding for his SGB Premiership side, Rye House, so Panthers will draft in a guest. They had initially booked Poole man Brady Kurtz, but were then blocked from using him due to a change in the top-flight averages. Club bosses were still working on a stand-in yesterday as they bid to avoid any further Alwalton setbacks after two home defeats already. 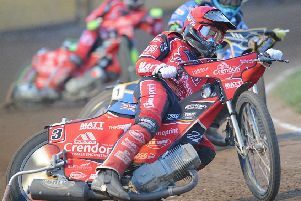 Johnson certainly won’t tolerate a repeat of the terrible start against Sheffield, where his side conceded four advantages in the opening five races and had to use a tactical ride. Johnson added: “Some boys had the wrong setup and others had the wrong mindset last Sunday against Sheffield – and it cost us dear. “Starting any meeting that sloppily is not good enough, especially at home. We need to be on it from the second the tapes go up for the first time.